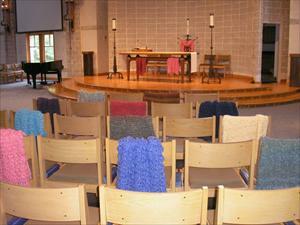 The Prayer Shawl Ministry is a vital element of pastoral care at Woods church. Shawls are knitted with prayer and blessed by the hands and intentions of the knitter. Recipients of shawls are cradled in hope, kept in joy, graced in peace and wrapped in love. During the dedication, add your personal blessings to the shawls, knowing that they will become instruments of peace – enfolding others in comfort and strength. This ministry meets monthly. Please contact the church for dates and times.